I really need help with this, please. How do you assign a template to a page in 5.0. I don’t see that easy-to-find tab that has always been there to do that. Do you mean editor? In WP 5 has a new editor, Gutenberg. If you not wanting to use Gutenberg, you can install Classic Editor WordPress plugin, which hides Gutenberg. Templates are theme based. What theme are you using? 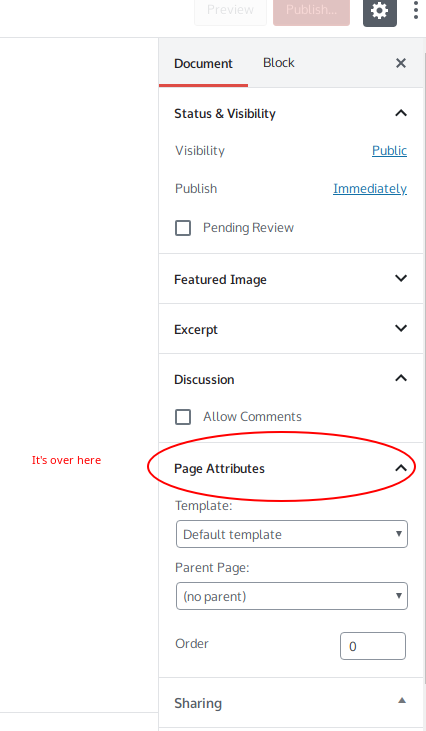 Under the Page Attributes sidebar my theme is showing templates. This reply was modified 4 months ago by Radices. I am using TwentyNineteen. It does not have that there. Why not? Have you created any page templates? If there are none to choose, then that isn’t there. There are none in the TwentyNineteen theme. This reply was modified 4 months ago by Steven Stern. See my note (we seem to have crossed in passing). I have reviewed over 10 themes and no of them have it. I guess I should try creating one first. I would think that the option would be there by default as in the older WP platforms. Let me create one and get back to you. This reply was modified 4 months ago by iamteejay19. The image I posted was from a child theme (of 2012) on my Gutentest site. Side note @iamteejay19 Do not create multiple topics for the same thing. This is not a Developing with WordPress topic and your other 3 topics were archived.